With the Kosovo government inadequately implementing the law on citizenship, minorities are left undocumented, the Ombudsperson Institution claims. After a two-year endeavor, Svetlana Rakic, a Serbian citizen whose parents are from Kosovo, has finally given up on actively pursuing Kosovo citizenship. Born in Kraljevo, Serbia, to parents who were born in Kosovo but left in the ‘80s, Rakic moved to Mitrovica in 2004. She’s been living and working in Kosovo since then, and eventually married a Kosovo citizen who she met at a conference. A couple of years ago, while pregnant, she decided to comb through all legal pathways to attaining Kosovo citizenship. She contacted the Ministry of Internal Affairs and listed the criteria that she believed she met with relevant official documents attached. “I was talking with someone in a very senior position at the Ministry of Internal Affairs [MIA] who was trying to help me attain the citizenship,” she recounted over coffee. She then pulled out a thick manila folder containing her own and her parents’ documents, as well as all records of her correspondence with the MIA. Although she had her parents birth certificates, neither of them have Kosovo citizenship documents; they haven’t lived in their hometown of Istog since the ‘80s and have never applied for Kosovo ID cards or passports. For the MIA, this was the first problem with Rakic’s request. The Ministry then asked for paperwork proving her parent’s land ownership in Kosovo, so she sent over her parent’s land documents, issued in 1978 in Albanian language. The Ministry told her that to use them, her parents would first have to attain Kosovo ID cards and then go to the cadaster to register the property under a new lease. After months of e-mailing back and forth, by the end of 2016, Rakic went in person to the MIA’s Department for Citizenship, Asylum, and Migration. There, officials told her that she was basically approved for Kosovo citizenship, but that she just had to submit a couple of documents–like her original birth certificate and a paper from Serbia showing that she is not under any investigations–marked with official apostille stamps. However, when she traveled to Serbia to get these stamped documents, she was told by Serbian officials that the state does not put the apostille stamp on original copies. She brought stamped copies of the originals back to Kosovo, but they were rejected. “I stopped there,” she sighed. Rakic has a potential path forward: since her husband is a Kosovo citizen, she could apply for citizenship on the basis of her spouse’s status. However, they were married in Zubin Potok in the Serbian system (Kosovo institutions still do not perform marriages in this northern Serb-majority municipality), so the Kosovo government deems their marriage license to be illegal. Rakic could get divorced, attain a ‘freedom to marry/single status’ document from Serbia, get remarried in another municipality in the Kosovo system, and then wait three years to be eligible for citizenship through marriage. Rakic was born in so-called ‘Serbia proper’ and thus has an undisputed Serbian passport. However, for others, whose Serbian coordination directorate passports and Serbian IDs with residencies in Kosovo have been deemed ‘illegal’, panic is setting in. Such is the case for Kosovo Milica V., who tried to apply for citizenship documents in North Mitrovica this summer when holders of Serbian Coordination Directorate passports were being turned away by Kosovo Border Police. She brought her SFRJ-administered birth certificate, which shows that she was born in Mitrovica, as well as her father’s valid biometric Kosovo ID card. But without an old UNMIK ID card or Kosovo-administered birth certificate, she was told she could not get her papers. The municipality officer, who she described as “very kind,” told her that she could get a Kosovo-administered birth certificate, but could not apply for citizenship documents at that time. “He told me, ‘I can’t help you, really I wish I could. It’s better for you to wait for a new law that will get things back as they were,” she said, referring to the time when Serbian Coordination Directorate passports were accepted at Kosovo borders. Kosovo’s Law on Citizenship was modeled almost directly after provisions in the Ahtisaari Plan and was one of the very first laws adopted after Kosovo’s declaration of independence. It contains citizenship pathways for pre-war residents of Kosovo, and acquisition pathways through adoption, naturalisation, birth, direct descendance, and marriage. It was designed to facilitate the integration of people with ties to Kosovo, particularly the diaspora and displaced persons, and to support the integration of Kosovo Serbs, explained citizenship scholar Gezim Krasniqi. But in practice, the process can takes years and is sometimes fruitless. One major problem reported by individuals who have been rejected regards proving that one was a citizen of the Federal Republic of Yugoslavia on January 1, 1998, and had ‘habitually resided’ in Kosovo for a consecutive period of at least five years before this date. The Kosovo Ombudsperson Institution has been receiving a spike in complaints in this area, according to Aleksandra Dimitrijevic, Senior Legal Advisor to the Ombudsperson. The institution is currently handing 22 citizenship dispute cases, which involve even more people since single cases are brought by one whole family or group. The majority of the current complaints have been made by displaced persons who intend to return to Kosovo. Other cases include residents of northern Kosovo, Albanians who now live in Presevo, Serbia, but lived and worked in Kosovo before 1998, and cases brought by Roma, Egyptians, and Ashkalis (for example, one case that Dimitrijevic mentioned regards 36 people belonging to these communities from Gracanica who do not posses any personal documents and are not listed in any state registries). The registration procedure for persons born in Kosovo begins at the municipality office at their place of birth. If a person is registered in the civil registry books of the municipality they were born in or in which they had permanent residency before 1999, but they do not possess UNMIK registration documents, the applicants receive a birth certificate with the citizenship section crossed out with the marks “///.” Otherwise, one receives a Kosovo birth certificate with “Kosovar” listed in the citizenship section, and can then apply for an ID card and passport. 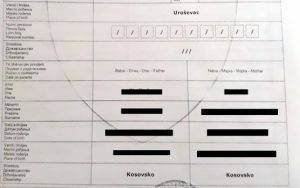 Kosovo birth certificate with a crossed-out citizenship. In cases when the citizenship section is crossed out, the individual needs to submit the request for the right to citizenship to the civil status office in their birthplace. The MIA’s Department for Citizenship, Asylum, and Migration reviews the request, which can take up to six months. People must personally go to the directorate to check the status of their request, Dimitrijevic said, because they will not receive a notification when the decision has been made. If the department refuses a request, the person must file a complaint to the second instance, the Agency for Civil Registration in Prishtina, which “usually just confirms the decision of the Department for Citizenship, Asylum, and Migration,” Dimitrijevic told Prishtina Insight. One then has 30 days to file a complaint to the Administrative Matters Department of the Prishtina Basic Court. This process can take up to two years, because the Basic Court in Prishtina, which is riddled with an insufficient number of judges and case backlogs, is the only one that deals with these administrative matters. According to Dimitrijevic, the most common explanation that people receive for rejection, in both written and oral form, is that they did not register in time and that they are not in possession of UNMIK-issued IDs. However, she emphasized, an administrative instruction for the citizenship law clearly states that individuals must meet only one of the criteria of the instruction’s article 3 and submit one of the documents listed in article 4. “Still, they requested that applicants fulfil all of the criteria and to provide proof for them… MIA’s Directorate for Citizenship, Asylum, and Migration incorrectly interprets, or rather selectively implements, Article 32, Paragraph 1 of the Law on Citizenship 4/L-215,” she said. But Liridon Neziri, head of the citizenship division within the Department of Citizenship, Asylum and Migration, said that internal and external reports show that the department is functioning properly. “Nobody was ever discriminated against based on ethnicity or race. Yes, there is a bureaucratic process and lawful procedures, but we have to consider the security aspects. We are constantly monitoring these cases,” Neziri told Prishtina Insight in a sit-down interview. He added that although there are no current plans to end the registration period for this category of citizens, it will not be open indefinitely. To increase accessibility, he said, the Ministry of Internal Affairs recently implemented administrative instruction no.05/2017. It replaces the previous instruction, no.05/2014; changes are minimal, but include an even more extensive list of accepted documents to prove identity and residence, from university indexes to military cards. “However, the question is whether the new administrative instruction will be implemented properly by the responsible bodies,” Dimitrijevic said. She argued that MIA officers and civil status office employees need to be better trained on how to implement the law and follow the new administrative instruction. The issue of marriages conducted in the Serbian system in Kosovo remain unaddressed in the new administration instruction. An e-mail response from the MIA claims that according to a government decision from March 2017, the Ministry is in cooperation with the Minister for Dialogue to address this issue. “[The offices] are considering the possibility of compiling a circular that aims to implement a decision to deal with the registration of all civil status issues that happen in the territory of the Republic of Kosovo, including in the north. Every request for birth, marriage, or death registration, according to legislation, should be given to the municipal offices of civil status,” the response states. Meanwhile, for people who are in this predicament, such as Svetlana Rakic, it feels as though there has been no tangible progress. Ljubisa Mijacic, a resident of Zubin Potok who also was married within the Serbian system in Kosovo, said that this bureaucratic rollercoaster ride is what keeps him from attaining a Kosovo ID. “The Kosovo government perceives my marriage as parallel and demands my wife to willingly sign that she is unmarried in order to obtain the Kosovo ID in her maiden name. That simple signing act would produce more problems afterwards than it would solve, and for that reason, I do not have a Kosovo ID,” explained Mijacic.